Each month in 2018, I plan on investing a small amount of money into a Blockchain project that I think might have potential to be a useful service/product. I plan on documenting my research on the specific Blockchain projects in blog posts as a way of making sure I do some due diligence, rather than just investing in whatever seems to be doing well that month. My aim here is not to just invest in coins that will make me the most money in the shortest amount of time. It’s more to invest in coins/projects that I feel might actually have a long-term future. THIS IS NOT INVESTMENT ADVICE!!! Decentralized VPN running on the Blockchain – The Mysterium Network will be a decentralized marketplace for VPN services built using Ethereum smart contracts. Users set up nodes to contribute computing resources to the network. In exchange, they collect a fee from clients who agree to pay to use their network resources. Service matching between provider nodes and client nodes, payment service, identity management, and a database of account balances, available service providers, and registered identities are all executed on the Ethereum blockchain. The VPN services themselves are executed off-chain. First of all, I agree with Mysterium’s mission statement (Section 1.1 in their whitepaper). The internet is neither open nor private. The recent Net Neutrality repeal in the US is a great demonstration of this. Whilst, I am often of the opinion “if you have nothing to hide, why do you care?”, I think we are getting to the stage where companies/governments ‘could’ start to use our ‘online activity’ in ways that we may not appreciate or consent to and we can do nothing about. Personally, I’d like to have the option to choose whether or not my browsing habits, online communications can be seen or not. Mysterium looks to provide a solution to help address this. VPN solutions have been around for many years. This is nothing new. However, to date, all VPN solutions are centralized, meaning you always connect to the same organization centrally, who provide this service. For VPN users who wish to stay anonymous, they must trust that central VPN providers do not collect and distribute the VPN logs of customers who connect to their service. Mysterium is creating a solution where decentralized VPN services can run, where there is no central entity managing the connections and the subsequent VPN logs. In a decentralized VPN solution, each node will have logs of who connects to them. In Phase 2 of this project, Mysterium is planning on creating a protocol that will be capable of “dissolving” user data, sending it deep into the network of nodes, essentially shredding the data making it unrecognizable. 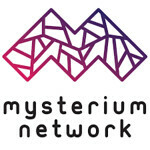 The mysterium network essentially allows anyone with an internet to run a VPN node, allowing consumers of this service to utilize your spare bandwidth that you have already paid your ISP for. In return for allowing consumers to use your spare bandwidth, you will receive MYST tokens as a form of payment. So even if you are not interested in using the VPN solution as a consumer, you could be a service provider and earn money by selling your spare bandwidth. I still have some concerns when it comes to service provider security. If you are allowing a complete stranger to use your internet connection, what is in place to make sure that the service consumer cannot use your connection to cause ‘no-good’? Whilst I may not sign up to be a service provider on day one, I really like what Mysterium are trying to achieve with this project. I also believe in the light of recent events, the usage of VPN solutions is only going to grow. Their project team, don’t seem to have any evidence of previous company success. However, everyone has to start somewhere right? I don’t think the scope of this project is too big for a team that maybe doesn’t have so much experience in running a startup. A quick check on Github, looks like work is being done on a daily basis which is always a good sign. I’m looking forward to following how this project progresses. If you have any thoughts, please comment below.